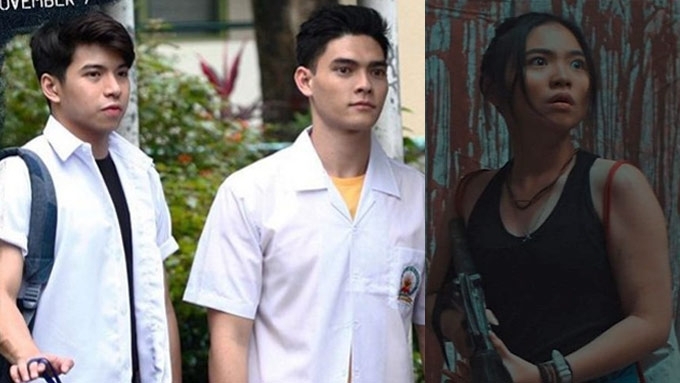 (L-R) Nash Aguas, Ethan Salvador, and Sharlene San Pedro are ready to rumble with zombies in the horror movie Class of 2018. Class of 2018 brings together Nash Aguas and Sharlene San Pedro as they lead their classmates in dangerous territory. Directed by Charliebebs Gohetia and co-written by Jericho Aguado, Class of 2018 is a reunion movie of Goin’ Bulilit alumni Nash, Sharlene, Kristel Fulgar, CJ Navato and Kiray Celis. They are now all grown up and ready to rumble with their weapons of choice. This horror film also marks the big screen debut of T-Rex artists Lara Fortuna and Aga Arceo. In Class of 2018, troubled and neglected high school kids are out on field trip. They are suddenly abducted by militarymen and held in a remote and secured facility. The trapped students discover that their lives are in danger. With no way out, it’s every man for himself in the free-for-all. Friendships are questioned, desires are unleashed, and intentions are made known. Any film about a whole high school class of troublemakers kidnapped and taken to a secluded place to kill each other would now invariably draw references to a certain 2000 Japanese dystopian film titled Battle Royale. This movie stoked the fire of teenage angst and gave birth to various incarnations. Class of 2018 can be faulted for a multitude of things but its entertainment value is definitely not among of these. It’s funny as hell. It’s certainly billed as serious horror firm but you’ll find it’s really more of a campy kind of horror —like a Goin’ Bulilit episode set in an abandoned building with zombies. Very early on, the opening sequence tells us the film is set against the backdrop of a bigger, more sinister picture involving the military and a lot of weird science, giving us a hint of the richness of the plot. It then shifts to the smaller picture—a local high school which, at the moment, is simmering in rage over a leaked blog that dishes out the dirt on, well, everybody. As these doomed kids slug it out with each other, we see their amusing individuality, their quirks, and hang-ups. And even though they are trapped in an abandoned building, these angry kids continue trading witty insults. The death scenes are so amusing that they make you laugh and wince at the same time. It also sneaks in several dramatic and romantic moments where it counts. Some of the kids have accepted the impossibility of their situation and just chose to spend their remaining hours silently in the company of classmates they are close with. Even though the film is a horror flick, there are plenty of kilig moments brought to you by the Nash-Sharlene and CJ-Kristel love teams. Class of 2018 attempts to strike a delicate balance between taking jabs at serious socio-political issues while maintaining its entertainment value. It succeeds and fails in equal measure. Still, it is an intelligent film that chokes on its own ambition largely because of the confused mixture of treatments: the result perhaps of the desire of filmmakers to please a wide spectrum of audience. In the end, it became a film with no definite nature. It is not a serious horror and not a black comedy either. Being a mix of both genres could have worked more to its advantage had it toned down the camp in favor of a more natural snarkiness if the purpose is to introduce comic relief or establish the troubled condition of the children chosen for the vile experiment. Despite it flaws, Class of 2018 is still worth your time as it is a brave effort at introducing a richly-plotted and socially-relevant film to the younger audience. It carries several deep themes like love and respect for life. Each time a character dies, a montage flashes snippets of the life snuffed out of him, a seconds-long commentary on how violence can degradation destroys not only the body but also the spirit. On a societal level, it attacks government dishonesty and disregard for the sanctity of human life. It reflects the hope of the youth to keep fighting for the country we all deserve. It may also well be a treatise on the sadness of children, a phenomenon largely invisible to parents as they plow through responsibilities day in and day out. Class of 2018 also stars Yayo Aguila, Adrian Alandy, Dido dela Paz, Alex Medina, Sherry Lara, Michelle Vito, Ethan Salvador, Jomari Angeles, Kevin Miranda, Nikki Gonzales, Shara Dizon, Hanna Franciso , Renshi de Guzman, Dylan Ray Talon, Micah Jackson, Jude Matthew Servilla, Jon Vic de Guzman, Yvette Sanchez, Jerome Canlas, and Noubikko Ray. The film produced by T-Rex Entertainment Productions is now showing in cinemas nationwide.